As I browse through the Chef’n website, I feel like a little kid in a candy store. They have so many cool gadgets and kitchen tools that would be wonderful to own and would save me so much time and make life in the kitchen a little easier. They are definitely the mecca of kitchen tools! You can so many innovative products at Chef’n including a huge assortement of salt and pepper grinders, gadgets like the Juicester and the FridgeFork, tools like the Slicester and cleaning accessories. I received the 4-in-1 Cheese Grater for review. I must say this is the Cadillac of cheese graters and beats any other one that I have ever owned hands down! We use cheese in many of our meals (tacos, nachos, pizza, etc) so I knew it would be well used and I couldn’t wait to try it out! 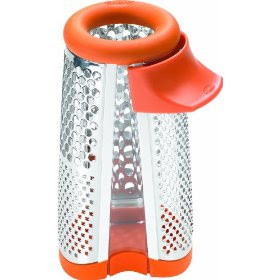 The 4-in-1 Cheese Grater has four different grating surfaces- coarse, fine, hard cheeses and zest. It also comes with a removable base so it’s virtually mess free. I grated cheese for our nachos and I love how all the cheese goes inside the grater. I used to grate over a plate and get cheese everywhere! Now I just remove the base and put the cheese on my dish. Voila! No mess. Big big plus in my books because I am like the messiest cook EVER! I really like that there are four ways to grate the cheese so you can change it up a bit. I liked the fine grater to put fresh Parmesan on our spaghetti. Yum! It’s super easy to clean too. This is one fabulous product! You can find Chef’n products by visiting their site and finding a store near you or purchasing from an online retailer listed on their site.